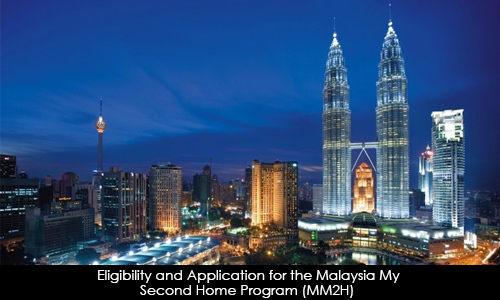 The Malaysia My Second Home Program was created by the Malaysian government to encourage foreign national to move to Malaysia and begin their new lives there. This program grants the individual a 10 year multiple-entry visas that can be renewed indefinitely by the recipient provided that he/she abides by the rules and laws present in the country. The individuals are also allowed to invite their parents who are over the age of 60 to move and live with them in Malaysia after they have been approved into the program. There are three categories under which an individual can apply to be considered in the program. Firstly an individual can apply in the category for people above the age of 50 years for which the individual has to be receiving a monthly pension or retirement income of over MYR 10,000 or a monthly salary of MYR 10,000 with a fixed deposit requirement of MYR 150,000. Secondly, an individual can also apply under the category of people under 50 years of age where a monthly salary of MYR 10,000 is required together with a fixed deposit of MYR 300,000 is also required. Additionally an individual also has to show liquid assets of approximately MYR 500,000 to qualify. Finally, there is a category for individuals who have purchased properties worth over MYR 1,000,000 whereby a conditional will be given in such case. The processing time for this type of visa takes approximately 55 hours before being approved or denied. Once an applicant successfully passes the first step, then e/she is required to plan to travel to Malaysia within the validity of the entry visa. The planning should incorporate the stay in the country for approximately 3 to 5 working days for which the application will be further processed. The applicant then has to apply for the entry visa to be stamped at the Malaysian embassy. At this point the applicant is required to produce his/her original passport, entry visa letter, the copy of the MM2H approval and the payment for the application process. Once this whole process is completed and all the information is verified, the applicant can then be allowed to start a new life in Malaysia. This gives people with the ability to financially support themselves an opportunity of enjoying life from a different country that offers a unique opportunity.